1. Tell us a bit about the Ever After series. The Ever After series consists of three stories (with plans for more) that involve some aspect of Reality TV. Ever After is the name of the production company, and the four person film crew appears in each story. Other secondary characters appear, too, but each romance is standalone. I recently added epilogues to the first two books, The Honeymoon Prize and The Cinderella Princess, to align the series together. It was so much fun to revisit those stories! 2. What is your favorite thing about being a writer? What is the most challenging? My favorite thing is imagining a story in my head and seeing it come to life on the page (well, my computer monitor.) Although I must admit, wearing pajamas while I work is a close second. The most challenging thing for me is time. My kids are still at an age where they need me, and no matter how hard I try to plan out a writing schedule and be organized, something invariably happens (often two or three things!) and I’m left scrambling to make a deadline. 3. What is your favorite scene from Christmas at the Castle? Oh, good question. There are a couple that come to mind, but I think it would have to be one I added in, not quite at the last minute, but close to it. Kat goes sightseeing with the crown prince and a marquess. Claude who is the chauffeur/body guard is also with them. It’s a short scene but a fun one for me to write because these two hot royals are acting worse than school boys trying to impress a cute girl. The heroine wants none of it, and I love how she takes control of the situation and puts the two men in their places. 4. Do you and your family have a favorite holiday tradition? On Christmas Eve, we each open one present, and it’s always pajamas. You’d think this might get old, but the kids still love it. The pajamas are washed before they are wrapped so they can be put on right away and worn to bed that night. In the morning, everyone has their new PJs on for pictures. 5. Do you have any other upcoming releases you’d like your readers to know about? 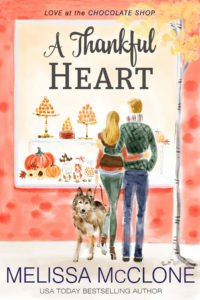 I’m very excited about my November 3rd release called A Thankful Heart. It’s the second book in the Love at the Chocolate Shop series set in Marietta, Montana. The heroine works at Copper Mountain Chocolates and is also a volunteer at an animal rescue—something near and dear to my heart. The hero is an architect from Seattle who is in town to care for his injured dad for the month. I’ll be writing two more books in the series. Those will be out in February and May. 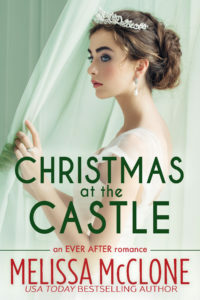 Get your copy of Christmas at the Castle from your favorite retailer today! Click here to subscribe to Tule’s newsletter and keep up with all of your favorite authors! Melissa McClone’s degree in mechanical engineering from Stanford University led her to a job with a major airline where she travelled the globe and met her husband. But analyzing jet engine performance couldn’t compete with her love of writing happily ever afters. Her first full-time writing endeavor was her first sale when she was pregnant with her first child! Since then, she has published over thirty-five romance novels with Harlequin and been nominated for Romance Writers of America’s RITA award. When she isn’t writing, she’s usually driving her minivan to/from her children’s swim and soccer practices, 4-H meetings and dog shows. She also supports deployed service members through Soldiers’ Angels and fosters cats through a local non-kill rescue shelter. 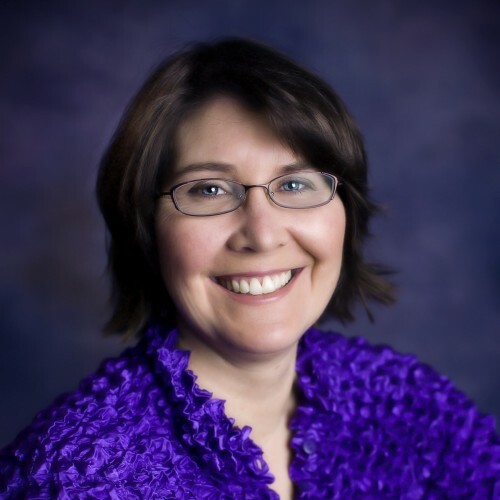 Melissa lives in the Pacific Northwest with her husband, three children, two spoiled Norwegian Elkhounds and cats who think they rule the house. Congratulations on your new release! Your favorite scene in the book is also my favorite scene too. She really did put them in their place. So glad you enjoyed that scene, too! I just loved writing it. I was giggling the entire time! Congratulations on the new book! I love your stories! Happy Release Day! Love your Ever After books! Congrats on your new releases, looking forward to reading both books! I loved that scene with Gil and the marquess. I too love how Kat handled it. To anyone who doesn’t have this book yet, get it and read it. This is a wonderful and sweet story!! Do you allow guest posts? I can write unique content for you.